MUNICH — He had to abandon his Munich Philharmonic cycle, a cosmic Fifth being one of its relics, but Christian Thielemann’s Dresden cycle* of the numbered Bruckner symphonies has progressed smoothly to near completion, and with video. Oddly parts of it have been filmed here at the Gasteig — scene of the crime, so to speak — most recently on Sept. 6 when the Sächsische Staatskapelle Dresden turned to the Symphony No. 1 in C Minor, Das kecke Beserl, or The Saucy Wench. Meanwhile, a Thielemann successor at the MPhil, Valery Gergiev, has this month embarked on his own Bruckner loop, also to be filmed, but at Sankt Florian. For him, the First has come first: Sept. 21 in a Gasteig concert and tomorrow (Sept. 25) at Bruckner’s basilica. Both conductors opt for the engaging Linz Version (1866) in its 1877 form, although for Thielemann this means an as yet unpublished edition with slight differences from the 1953 Nowak. Promoted by Bell’Arte, the Saxons’ program opened with a lush account of Bruch’s G-Minor Violin Concerto. Nikolaj Znaider powered the solo part, edgily at first but with eloquence in the Adagio and gutsy expression in the Finale, sending the maestro, among many others, into effusive apparent raptures. Znaider then went to sit with his St Petersburg boss, Gergiev, present to hear what wonders Thielemann would impart after the break in the still relatively rare 45- to 50-minute symphony, written the same year. The work’s nickname may be a bizarre projection, but its confidence is certain. There is much rhythmic energy; no chorale, fugue or Generalpause impedes the momentum. It opens with a march theme of some irony, moves to a lyrical subject and soon rises to an imposing yet isolated fanfare in the trombones. The development is restrained, the recapitulation free-form and based on a new theme. This reappears in the “agitated, fiery” Finale, a propulsive construct that shifts triumphantly to C Major. In between come a solemn Adagio with fancy violin figurations and a partly songful Scherzo. 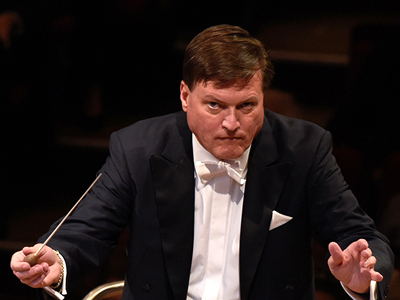 Thielemann (pictured the same day) conducted with his customary flair for counterpoint. He had memorized the music and shrewdly gauged its pulsations and climaxes, particularly in the challenging Finale, where a vein of spontaneity lit up the logic. Some hesitancy, though, in middle-movement details suggested he had not yet decided what to do with all the material, and perhaps for this reason his orchestra was not on top form. If Gergiev took anything away, there was scant evidence Sept. 21. He sustained lighter textures and found charm in unexpected places, persuasively in the Scherzo. On the other hand, a relishing of tone colors came at cost to inner voices in Bruckner’s scheme, lessening its impact. Nothing was implied in that opening march, for example. Nor were the dance elements well served. But the maestro kept his eyes locked on the score and drew a magnificent performance from the MPhil — strings transparent and silky where those qualities counted, intense and glowing elsewhere; brass blasting and soaring with tireless accuracy. Indeed, from its steep, newly modified risers, the MPhil sounded as virtuosic as it had in the finest days of, well, GMD Thielemann (2004–2011). Scheduled for after intermission was Bruckner’s Third Symphony, alas in its late version. This entry was posted on Sunday, September 24th, 2017 at 3:36 am	and is filed under Munich Times. You can follow any responses to this entry through the RSS 2.0 feed. Both comments and pings are currently closed.